The Sonos One won’t be exclusive to Alexa, the speaker will incorporate Google Assistant in 2018. Sonos made a host of announcements at an event in New York City on Wednesday, including a brand-new speaker—the Sonos One—that will incorporate Amazon’s Alexa voice service. And in a pledge to continue being service agnostic, Sonos CEO Patrick Spence said the Sonos One will also incorporate the Google Assistant in 2018. Sonos is taking preorders for the $199 speaker now and plans to ship it on October 24. As with previous Sonos speakers, you’ll be able to use the Sonos One independently, as a stereo pair, or as surround speakers in a home theater, backing up a Sonos Playbar or Playbase. You’ll also be able to use voice commands to control other Sonos speakers, even ones that don’t support voice commands natively. Existing Sonos customers don’t need to worry about being left behind, however. They’ll be able to control any Sonos speaker with voice commands via Amazon’s own Echo hardware or any other Alexa-capable device (including the Sonos One). There was no immediate word, however, whether this same capability would be available to Google Home users when that support comes next year. There’s a beta version of the Alexa-capable Sonos app available now to Sonos customers in the U.S., U.K., and Germany (the three markets where Amazon offers its Alexa Voice Service). “We often talk about flow in our homes,” said Sonos’ senior director of product management, Mieko Kusano. “We believe music should flow through a home. You can ask Alexa to play music in any room you have a Sonos product.” Kusano said you’ll be able to control volume, skip tracks, pause the music, and ask Alexa what song is currently playing with the new app and with the new speaker. Similar to other smart speakers, the Sonos One will be outfitted with an array of six far-field microphones so that you’ll be able to control it from across the room. The speaker will lower its volume as soon as you say “Alexa,” so that you don’t have to shout the rest of your request over the music. As with other Alexa-enabled speakers we’ve reviewed, however, you won’t be able to control Spotify with voice commands—at least not at launch. Sonos says that feature will come later this year. 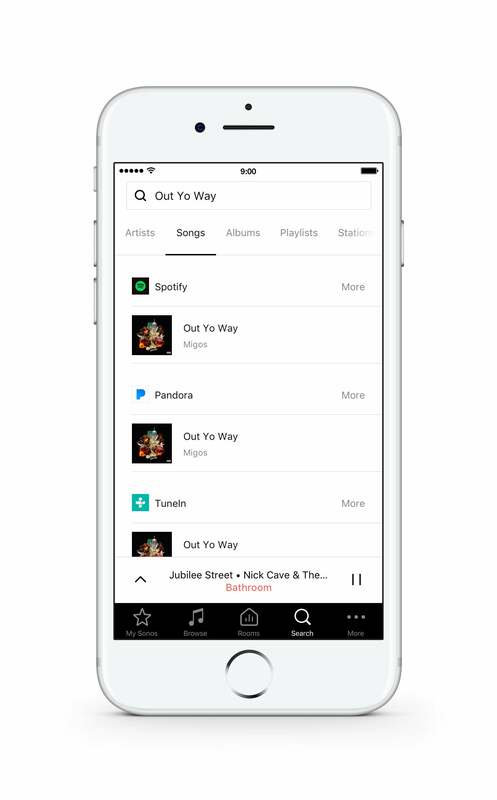 The all-new Sonos app features a nav bar the bottom of the screen. 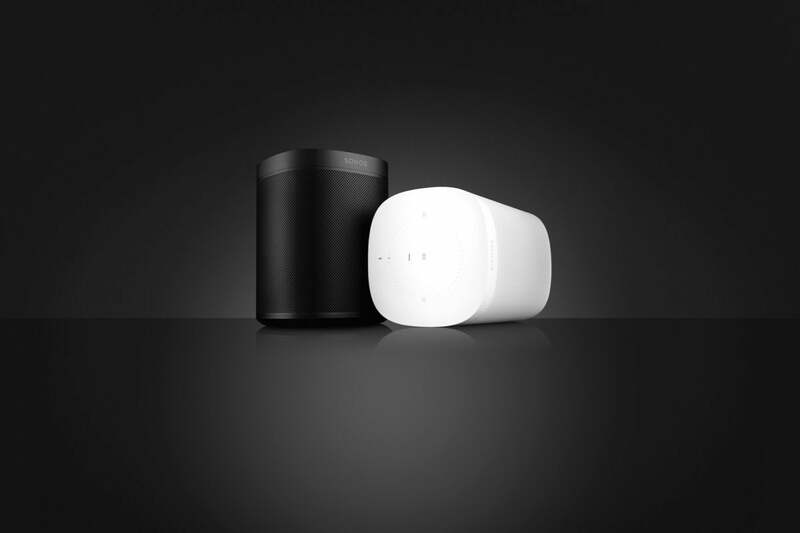 Voice control and the new speaker were the big announcements, but Sonos had more to reveal. Allen Mask, Sonos VP of partnerships, announced that Sonos will soon offer support for Apple’s AirPlay 2 technology, which will render all Sonos speakers compatible with Apple’s hardware ecosystem, including Apple TV. He demonstrated playing a music video playing on an iPad, with the iPad sending the soundtrack to a Sonos Play:5 speaker in perfect sync. He then fast-forwarded the video by sliding his finger across the top of the touch-sensitive surface of the Play:5. 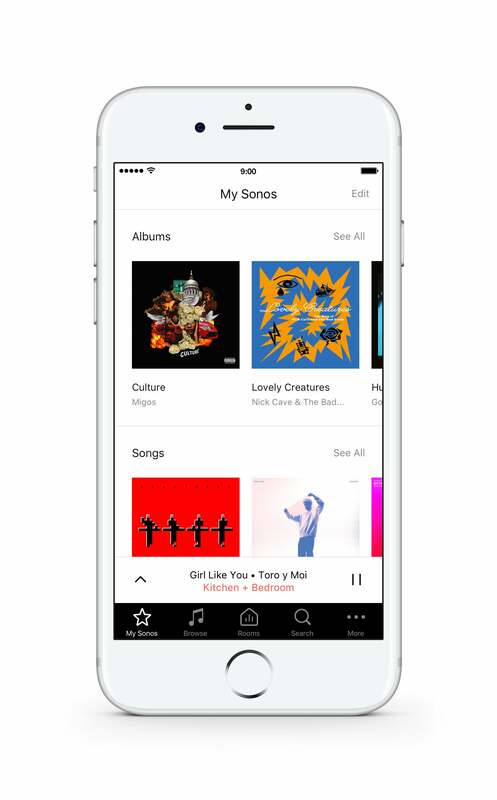 “Sonos is committed to being open, accessible, democratic, and universal,” Mask said. “By the end of 2017, you’ll be able to control your Sonos system directly from Pandora, Tidal, iHeartRadio, and Audible in the same way you can today with Spotify.” Mask also announced a new “Works with Sonos” initiative to support third-party services and manufacturers interested in tapping into a Sonos API that will be released in 2018. Mask said Sonos is already working with more than 100 companies, including Samsung SmartThings, Wink, Logitech, Control4, Wink, Crestron, Alarm.com, and more. 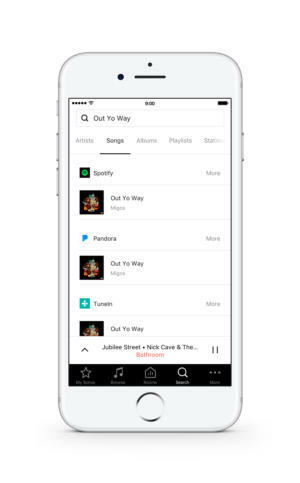 Sonos says its new app makes search even simpler. Antoine Leblond, VP Software, demoed a new version of the Sonos app that has a radically different user interface that he said will make it even easier to control speakers in multiple rooms. A new navigation bar at the bottom of the screen makes it easier to move between different areas of the app, and room control has been improved to make it easier to control what’s playing in each room. You can get a whole-home overview of all the Sonos speakers in your system. And a new My Sonos tab lets you bookmark all your favorite genres, playlists, and songs. Sonos pioneered the wireless multi-room audio market. The company shipped its first system in January 2005, but it didn’t introduce its first wireless speaker—the Play:5—until late 2009. Each new product launched since then has sounded better, taken Sonos into more rooms in the house (e.g., the home theater), or lowered the cost of entry to a Sonos system. But something big happened in 2014: Amazon introduced the Echo, the first mass-produced speaker that could respond to voice commands. It didn’t sound nearly as good as anything in the Sonos lineup, but being able to stream music just by asking for it was a magical experience. And while some later Sonos speakers were equipped with mics, they were there for automatically tuning the speaker’s performance to the room they were playing in—Sonos’ Trueplay technology—introduced with the second-generation Play:5. They weren’t designed to recognize speech, and even if they could, Sonos didn’t have any computational power in the cloud to convert that speech into action. Two years later, Sonos was laying off staff and announcing its intention to bring voice recognition to its product line. Later, the company said it was working with Amazon to enable its customers to control Sonos speakers with Amazon’s Alexa technology. In January 2017, co-founder and CEO John McFarlane resigned as chief executive and relinquished his position on the board of directors. We’ve been waiting since early April, when Sonos launched its Playbase TV speaker, to find out the company’s next move. We’ll soon find out if the wait was worth it. This story was updated with screenshots of the new Sonos app.